Detailed action, numerous photos and video. Battleship Bismarck is firing on Hood, pictured from Prinz Eugen. In that month, in company with the heavy cruiser Prinz Eugen, she sailed for the Atlantic to raid and disrupt the Allied convoy routes. 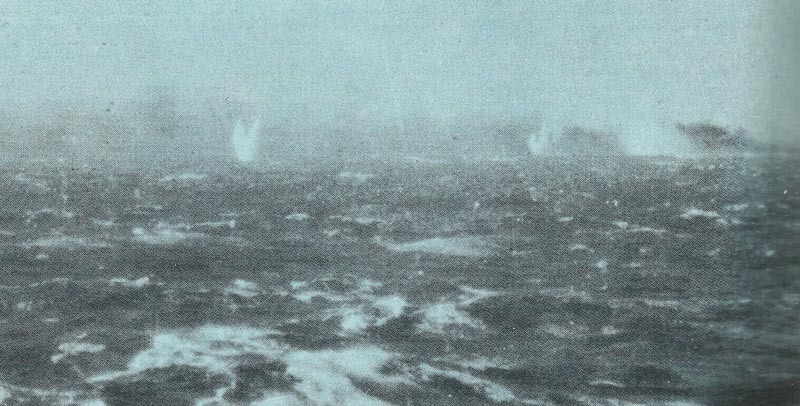 It was hoped to break out undetected, but late on May 23, while passing in fog through the Denmark Straits, they were sighted by the British cruiser Suffolk. She was soon joined by a second cruiser, the Norfolk, and despite efforts to shake them off the British cruisers began to shadow and report on the position of the German force. The battleship Bismarck is leaving Bergen in Norway for her last journey. The Bismarck in a fjord of Norway before the final cruise. At Bergen (Norway), the two ships are provided with a new camouflage prior to their cruise. The battleship Bismarck behind heavy cruiser Prinz Eugen. The shadowing British cruiser Norfolk fires. On the morning of May 24, two heavy ships appeared from the southeast and at 0532 the leading vessel, the battlecruiser Hood, opened fire on Prinz Eugen at a range of 24,232 m (26500 yards). The second ship, the battleship Prince of Wales, opened fire shortly afterwards while the German ships replied at 0535 hrs, both firing on the Hood. The Bismarck straddled her target with her third and fifth salvos, the latter achieving one or two hits. At 0601 hrs the after magazines of the British flagship exploded. She broke in two and sank in three minutes, leaving only three survivors. Fire was shifted to Prince of Wales but after about ten minutes the British ship broke off the action and retired. Shell impacts into the sea from Prince of Wales in front of Prinz Eugen. One of the last pictures from battlecruiser Hood, taken from Prince of Wales. A 15-inch shell of Hood misses Bismarck. Hood is exploding after the fifth salvo of Bismarck. More shells hit near the place were Hood was sunken, while Prince of Wales runs away on the left. Target change on Prince of Wales. Bismarck now behind Prinz Eugen. Bismarck fires on the retreating Prince of Wales, pic taken from the Prinz Eugen. The German flag ship had been hit by three 14-in (355- mm) shells from the Prince of Wales – one damaged and contaminated an oil fuel tank, another hit the side armour and caused a leak which later put one boiler-room and one dynamo out of action, while the third hit did no important damage. The contaminated oil reduced the ship’s endurance and the loss of one boiler-room reduced the speed by 2 knots, so it was decided to call off the operation and make for St Nazaire for repairs. The Prinz Eugen was undamaged, and later that day she separated and continued into the Atlantic. 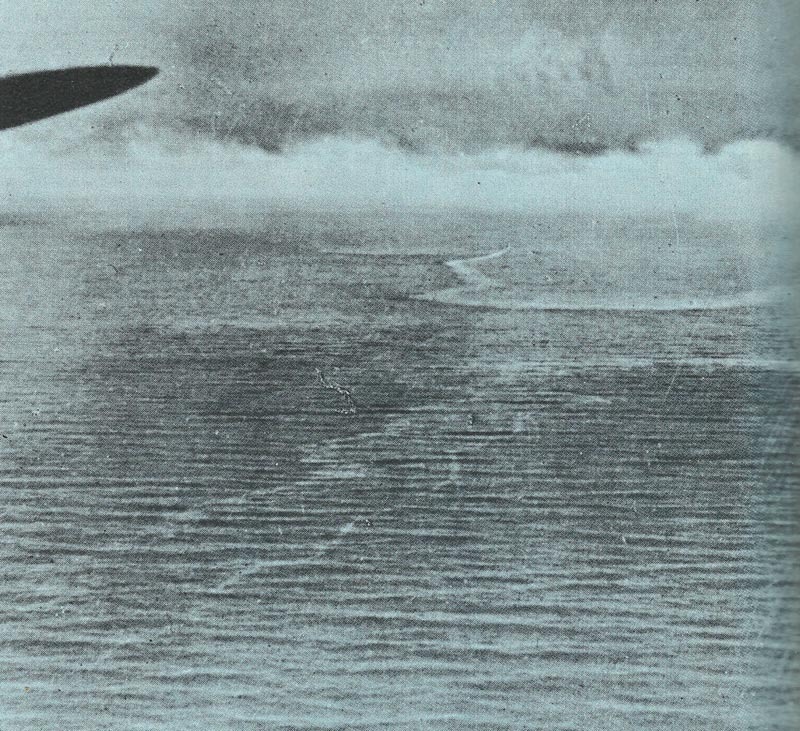 RAF reconnaissance plane discovered the irregular oil slick in the wake of Bismarck. On the evening of May 24, battleship Bismarck was attacked by Swordfish aircraft from the carrier Victorious and was hit by one torpedo, but no serious damage was done. Later that night she managed to evade her shadows, and by making a wide sweep to the west, remained undetected until 1030 hrs on the 26th, when she was sighted by a Catalina flying boat of Coastal Commando. This aircraft had been directed into the area after signals from the Bismarck had been intercepted and decoded on an Enigma machine. That night she was again attacked by Swordfish aircraft, this time from the carrier Ark Royal, and was hit by two torpedoes. One hit amidships caused only minor damage, but the second hit the stern and seriously damaged the steering gear. With both rudders jammed 15° to port she began steaming in circles, and then, using her propeller revolutions, started steering an erratic course to the northwest – towards the oncoming enemy. During the night she was attacked by destroyers of the 4th Flotilla, but they achieved little apart from the disruption of attempts to repair the steering gear. 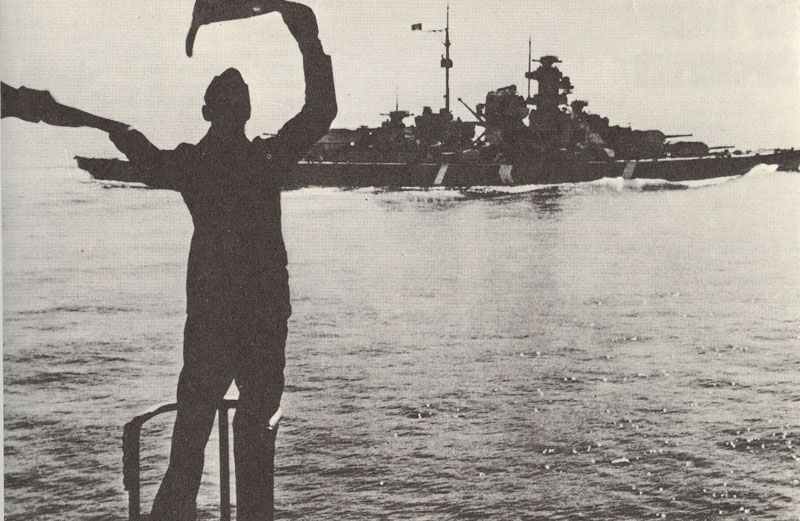 On the morning of May 27, 1941 two battleships appeared on the northern horizon, the battleship King George V (Flag Admiral Tovey, C­in-C, Home Fleet) and Rodney. The latter vessel opened fire at 0847 hrs, followed one minute later by the flagship. At 0849 the German battleship replied and straddled the Rodney with her second salvo. However, she was straddled herself by Rodney’s third and fourth salvos and a hit from the latter put A turret out of action. Five minutes later, at 0857, a direct hit put B turret out of action. Another hit destroyed the forward command post, killing most of the senior officers, and shortly afterwards the main fire-control positions, both forward and aft, were also destroyed. Salvos of Rodney and King George V surrounding the burning Bismarck with water fountains. By 0920 only X turret, under local control, remained in action and by 0940 the ship was silent. First Rodney and then King George V closed and fired on her at the point-blank range of 2743-3658 m (3000-4000 yards). When the British battleships finally ceased fire she was a floating wreck, very low in the water and on fire. At 1025 the cruiser Dorsetshire fired two torpedoes into her starboard side and, ten minutes later, a third into her port side. She heeled over and began to sink by the stern, and at 1040, her flag still flying, she capsized and sank in position 48°10’N, 16°12’W. There were 118 survivors. Tagged 1941, battleship, germany, kriegsmarine.